Except I just know once it came out, people would star bitching about how its yet another X. It may be another X, but it's a completely different style to it. Sure, the X1 Armor is a bit different, but the "Stealth Armor" is up a notch. This fellow even made his energy scarf. It's pretty damn incredible. I've never seen Jazware's take on Command Mission X, and I'm not sure if I should given what I'm hearing. Whoa, now. Command Mission was actually a good game. Any time you get to ragging too much on that Jazwares Command Mission figure just think of the Mega Man Zero figure from Jazwares and know the true horror of the sculpt! YOU ARE IN TIME OUT X, STARE AT THAT WALL! That is brilliant, right there. I loved Command Mission, honestly. And I would love to own a Command Mission X D-Arts figure. Anyone spot the hidden Steel Massimo? Always my favorite redesign among the gundam colored suits X tended to fall into. Definitely would be willing to buy this one. *squeak* Has anyone found a How To on the pages? 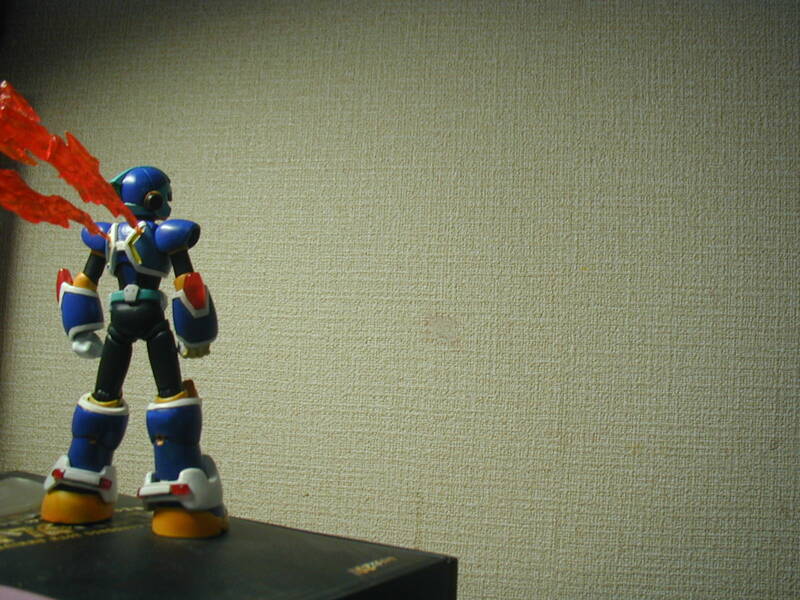 I've been wanting to custom my own characters off the X/Zero figures but I couldn't figure out how to make the Command Mission-esk boots D: (I was also sad to learn the Zero series figure wasn't to scale with the X series figures or else I'd have swapped Zero's boots. WOW!!! Just... WOW!!! As much as the game sucked and wasn't supposed to exist (according to Capcom the game isn't even part of the series/story) the figure looks VERY COOL!!! Though I can spot some rough spots on the white lines around X. And the paint isn't perfectly smooth, but it still came out GOOD!!! Especially the red jewel spots around his body and his scarf, WOW!!! YOU SEE JAZWARE INC.!!! EVEN JUST A FAN CAN MAKE A BETTER FIGURE THAN ALL YOUR STAFF COMBINED!!! LOL!!! Now if Bandai does make this figure it'll be much more better!!! Stupid Jazware Inc. stating that they have rights to make Megaman figures, that's just a mistake!!!!! 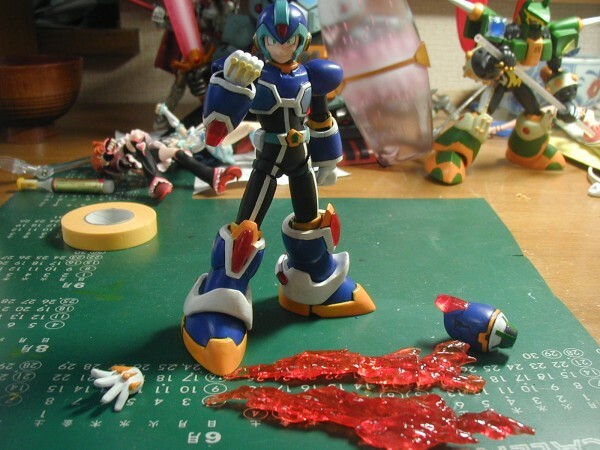 Give those rights to this fan, clearly he'll make better figures. Hey what additional pictures??? You can't even view them without logging into FC, which is in japanese. 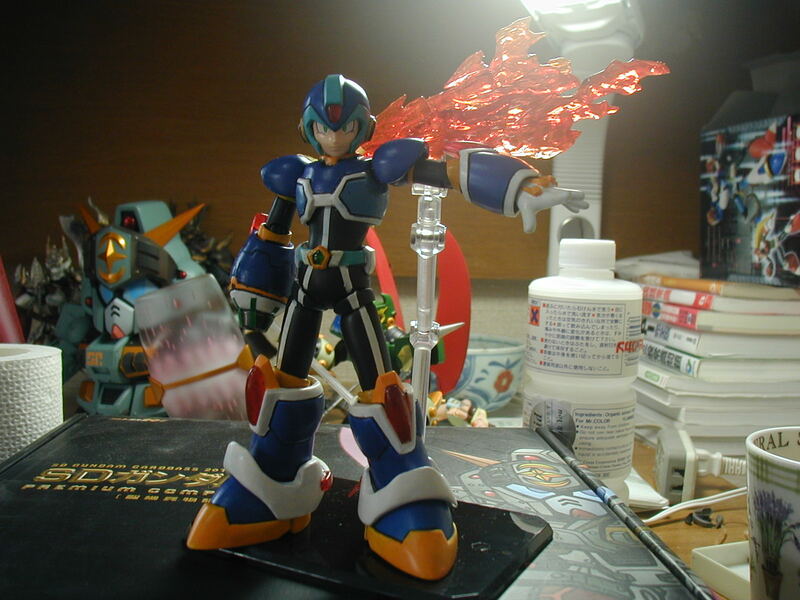 I must say that is the best MMXCM figure representation ever, it looks so official as if D-arts did it for real. Heck i could go above and beyond saying X escaped from the game trough the TV. the person who did this has great skill and for that Bandai should hire that guy to make the rest of the figures. kinda sad i can't view the rest of the pics since is in Japanese, they must be pretty aweome. Also, BADASS MAXIMO IS BADASS! Is that Steel Massimo real or custom made? Custom. Another creation from the same artist. I bet this one could sell at a higher price then the real figure! Obviously this x, is a custom should have been created from parts of a robot gundam type. If I find that robot is made. I do a tutorial, unless the creator sells it.